It’s late in the season and you still haven’t backed a buck. It’s this point in the season as winter has set in and the deer become less abundant that hunters can do one of two things: You can either throw it in and get your feet warm by the fire or you can set on out for another hunting trip. If you have a determined personality, you’ll head out to fulfill your deer tag no matter what the conditions. But there are some important things to consider when hunting a late season deer. Here are six tips to make it happen. First and foremost, as always the case, you need to think like a deer. Where would a big buck this time of year be hiding out. Like any animal that has made it through the winter, it takes grit and determination. Just like this hunting trip, you might say. 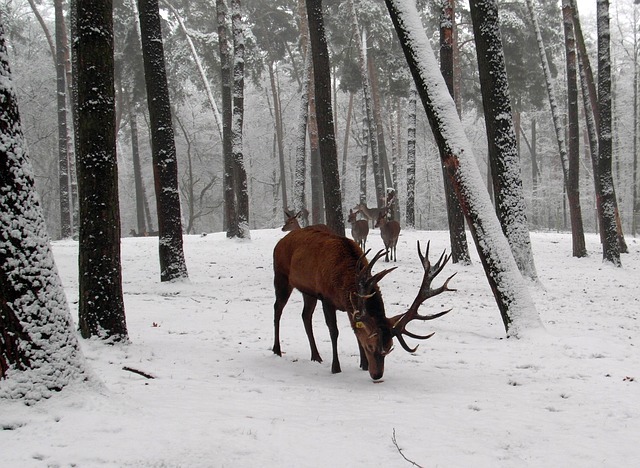 A deer can lose up to 30 percent of its body weight in the winter, so the chances are the buck is conserving energy. Because food sources are scarce late in the season and big bucks will be trying to conserve as much energy as they can, it’s likely they will find places that have both cover and a food source nearby. Hunting late in the season means that you are also competing with other hunters. For this reason deer are likely to be hanging out in areas that other hunters haven’t reached yet. You may have to trek further in worse conditions to find that big buck you’ve been waiting for. One of the biggest threats that deer late in the season face are that from coyotes. Many times late season deer can be found close to residential areas. That’s because they may find better protection from roving coyotes and possibly wolves. Never estimate the power of a southern facing hillside with good sunshine. Deer will seek the bright sunlight for warmth and if there is some food source nearby than all the better. If you’re schedule is flexible, consider hunting on a day when it warms even slightly from average temperatures that week. Choose a day if you can that’s sunny and it’s more likely that the bucks will be moving, but don’t look for them to cover as much ground than during the fall as they just don’t have the energy anymore.